You don't even need cutlery for most Curbside noms. If you were looking for something fun to do today, you may want to head to the Curbside Cookoff at 11th and H Streets NW. Although the “most popular Food Trucks in D.C.” have been serving everything from sandwiches to sweets since 11 am, this evening, from 5-8pm there will be live dance performances and music. Trust me when I say that you will be grateful for the distraction, as your food is prepared. That’s how I felt yesterday, when I waited for a delicious District Taco. I was in line for about thirty minutes, which flew by because of all the people watching– the event was packed. Once at the front, I was told that our tacos would be made to order and considering how slammed they were, that might take a little while. It all seemed so festive, I barely cared. I took my number and wandered over to the stage and watched hand-dancing, break-dancing and finally line-dancing. The best thing about Curbside Cookoff is how it took on the feeling of a neighborhood block party– in the middle of buttoned-up, downtown D.C. By the time the dancing was over, my tacos were ready– and well-worth the almost year-long wait. I have seen some complaints on Twitter about the lines (true) and the lack of vegetarian options (not true– I could’ve had pizza, Sauca, Indian food and more if I didn’t want tacos). The lines are long; there’s no denying that. But this is a one-off event meant to celebrate Food Trucks, so it’s not comparable to trudging out of your office during a regular work day to grab something portable, to go. In my case, I especially didn’t mind waiting because I’ve never made it out to Arlington for District Tacos, but I’ve followed them for a year on Twitter and I have wanted to, very much. I can’t justify driving to Virginia to try a delicious-sounding breakfast taco and I’ve never had to run an errand near their twin perches of Crystal City or Rosslyn, so had it not been for Curbside Cookoff, I wouldn’t have been able to sample their fare. I must say, it’s worth the hype. Thankfully, they are working on being approved to dispense in D.C., so don’t bother hating on them for their name. Go earlier vs. later, because certain trucks will sell out of food. I went at 6:30 pm yesterday and missed BBQ Bandidos, entirely. I think the lobster rolls were gone by 7:30; the Sweet Bites dessert truck was done even earlier. 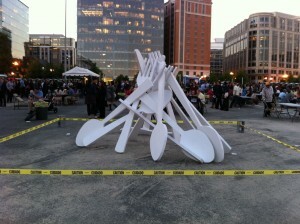 As I left Curbside Cookoff, I overheard groups of people discussing how “amazing” the event was. I agree. It was a lot of fun; I just hope that Food Trucks are allowed to flourish in this city. There’s a hungry, enthusiastic market for the diverse fare they offer, and if anyone doubts this, go to the Cookoff and see the lines for yourself. ← Curbside Cookoff is a hit.